Fridays - September 22 and October 6 - 1:00 to 4:00 p.m. 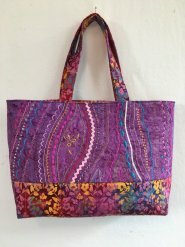 Learn the secrets of successful decorative stitching and show it off on this awesome tote! Use your decorative stitches to the maximum in this fun class where you will create personalized fabric. This is a two-part class - we will crate a unique fabric in the first session and assemble your sample into a one-of-a-kind handbag in session two! Requrirements: Sewing machine in good working order and basic quilting & Sewing supplies. Contact store for supply list.